SP Guide Publications (SP’s): With the change in ‘Security Dynamics’ what are the present as well as futuristic internal & external challenges before the Indian Army in the times to come & how well prepared are we to meet the emerging situation? Chief of the Army Staff (COAS): The dynamics of contemporary security environment with multiple challenges across the spectrum of conflict can be viewed and analysed for their varied manifestations. However, a pragmatic view is to consider ‘Low Intensity Conflict’ as a reality which is likely to keep us engaged in the foreseeable future. The nature of the conventional threats is premised along disputed land borders and thus the inherent primacy of the land forces. In the sub-conventional domain, terrorism forces us to commit resources and troops to counter this threat and remains our foremost challenge. On the other end of the threat spectrum is nuclear proliferation by rogue states and non-state actors and that remains major challenge for regional stability. Emerging threats for cyber, space and information domains are blurring physical borders and creating new challenges. We continue to enhance our capacity to cater to imminent security situations, be it internal or external. Operationally we have retained & maintained moral ascendancy on all our borders through proactive tactical operations guided by well-reasoned & thought out strategies. We have maintained the tempo of operations against terrorists through credible intelligence and ground level synergy with State Police & PMF with minimum inconvenience to local population. Also, in disturbed areas of North East, synergised intelligence based operations have contained the perpetration of violence to a large extent despite the abrogation of ceasefire by NSCN (K) & subsequent violent activities. Security along Indo-Myanmar border has been beefed up by effective additional deployment within existing resources to ensure effective border guarding. While we have carried out our operations with diligence, we have dedicated enough efforts to engage with locals of disturbed areas through Operation Sadbhavana & Samaritan. Our successful conduct of rescue & relief operations in various parts of country during incessant rains is well known to all. SP’s: How effective is the border management along Northern borders with China and Western borders with Pakistan where Army has the responsibility? In J&K robust counter infiltration deployment has been ensured on the Line of Control (LC). Terrorists have found it difficult to infiltrate because of our dynamic response against any attempt at infiltration. Terrorists have attempted to infiltrate through other areas like the IB sector of J&K. We are taking measures along with other security forces and agencies to deal with these situations of our borders. SP’s: At times we speak about India becoming a Regional Power. According to you, what role Army can or does play the role towards fulfilling this vision? SP’s: Future conflicts will require Inter-service Jointmanship. How far have the Armed Forces succeeded in this important aspect including setting up of suitable structure? COAS: This question has been appropriately responded to by the Chairman Chief of the Staff, in his capacity as the coordinator on all issues affecting the three Services and the Coast Guard. SP’s: It appears that you have initiated doctrinal and organisational changes to make the Army a cost effective organisation without losing its combat edge. What initiatives are being taken for rightsizing the Indian Army and optimum use of budgetary resources? 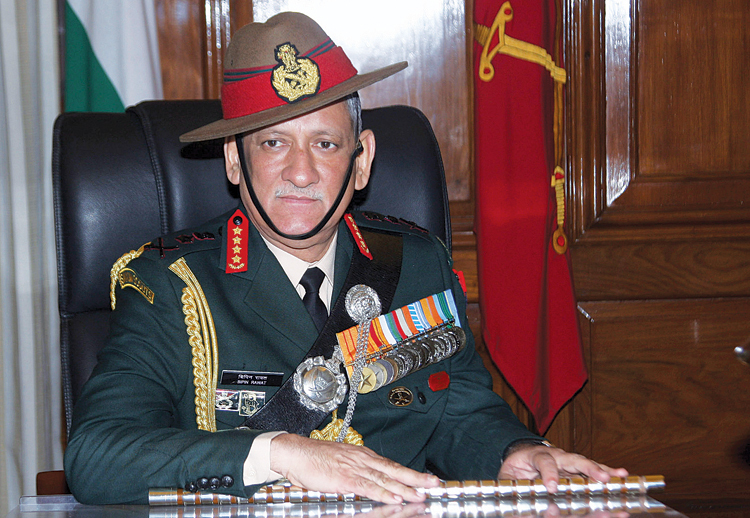 COAS: The Committee of Experts (CoE) headed by Lt General D.B. Shekatkar (Retd) was tasked by the MoD to look into certain aspects to enhance combat capability and rebalance defence expenditure which is at various stages of implementation. In addition to the recommendations of the CoE, we are in process of examining multiple optimisation avenues for rightsizing of the Indian Army. While manpower requirements along our borders and insurgency areas are crucial, there is a scope for determining redundant functions at all levels and manpower in noncore areas. The recommendations for optimisation, if deemed operationally viable, would be implemented. This would lead to savings in the revenue budget. SP’s: What is the progress on raising of Mountain Strike Corps for the Eastern sector? COAS: Operational readiness of the formation is a priority for the Army and the same is being vigorously followed up. SP’s: Army modernisation seems to have slowed down. What steps are being taken to remove the impediments and accelerate the process? COAS: Our modernisation strategy covers the entire spectrum of conflict and is structured along three cardinal approaches. Firstly, to address conventional warfare capability, we are investing into futuristic weapon systems like combat vehicles, artillery guns, air defence platforms, army aviation and other assets. Modernisation of Infantry weapons is high on our priority. Modernisation roadmap of Infantry lays emphasis on the domains of lethality and survivability, to empower our soldiers engaged in the proxy war as well as insurgency. The second category is the support systems required to augment main platforms. Our road map aims at harnessing technology to build capabilities in the domain of electronic warfare, intelligence, surveillance and reconnaissance. Third category would be the requirements for the ongoing operations in the constantly evolving operational environment. Our plans are aligned with the ‘Make in India’ initiative to intensify impetus for indigenisation. MoD has further strengthened the Armed Forces by according enhanced financial powers to meet instant requirements and is making endeavours for allocating requisite financial outlay. A large number of schemes are at advanced stages of procurement which once approved, would significantly boost the efforts of the Indian Army to transform into a more potent and adaptive force. SP’s: During the 2018 press conference you had announced that assault rifles will be imported and would be given in a selective manner to only those soldiers who will actually use them. This measure was probably taken to keep the cost low. What has been the progress on this aspect? COAS: Modernisation and infusion of technology into our war fighting system remains our enduring pursuit. We after a detailed in-house deliberation decided that not all soldiers require advanced assault rifles, therefore hi-tech 7.62 x 51 mm calibre assault rifles are being procured for only for the frontline troops. The procurement case is at commercial negotiation committee stage. For the balance of the troops, the case for procurement of 7.62 x 39 mm calibre assault rifle is also at advance stage. SP’s: Has the Army initiated any programme under the ‘Strategic Partnership Model’? COAS: Yes, Indian Army has initiated one programme under the Strategic Partnership (SP) model. The SP model has four segments and one of these is Armoured Fighting Vehicles and Main Battle Tanks (AFVs/MBT). Under this segment, Indian Army is pursuing a programme for a Future Ready Combat Vehicle (FRCV). The programme is still at the preliminary stages. We have received adequate number of responses and these are being evaluated. We are in the process of holding extensive interactions with the vendors. The entire RFI process is likely to be completed by February 2019 and thereafter we progress towards formulation of Service Qualitative Requirements and seek an AoN for the project from the Government. Post AoN from the Government, we will identify potential strategic partners and the OEMs, as per the procedure. SP’s: Now that Artillery has finally started inducting K9 Vajra and M777, after so many decades of lull in its modernisation process, do these inductions bring in some relief? Or we are still lagging behind? COAS: Modernisation of Artillery is underway with focus on augmenting ‘long range surveillance’ and ‘precision engagement’. Recently we have undertaken induction of M777 Ultra-Light Howitzers (ULH), K9 Vajra and indigenous weapon locating radar ‘SWATHI’. The induction of ULH and K9 Vajra is slated to be completed by December 2021 while that of SWATHI by January 2019. To give impetus to indigenisation, major projects such as DHANUSH Gun System, designed and developed by OFB and Advance Towed Artillery Gun System (ATAGS) designed by DRDO in partnership with Private Industry, PINAKA regiments and Up Gunning of 130 mm Gun Systems are being pursued with a sense of urgency. The modernisation of Artillery with guns having ranges up to 40 km and long range vectors capable of engaging targets up to 290 km will fulfil the firepower requirements of contact, depth and deep battles in mountains & plains. SP’s: Where, in your view, we stand in terms of our Army’s strength versus Pakistan’s and versus China’s? COAS: Strength of any armed forces must not necessarily be gauged by the numbers. I can assure you that our soldiers are well trained and prepared for any eventuality.